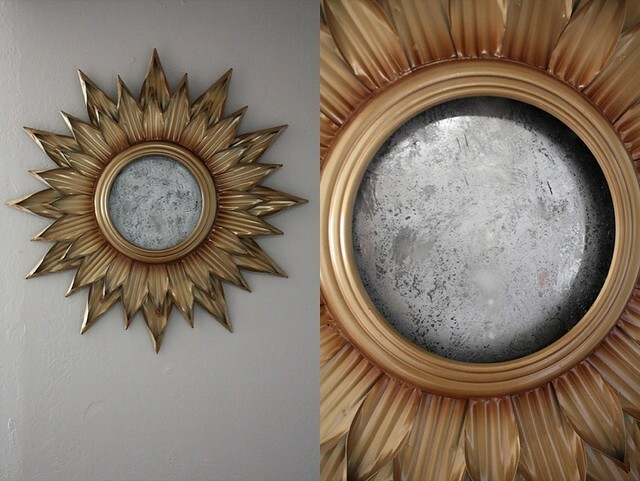 One of the things I've always wanted in my house—and forgive me for my silly aspirations; you might want an original Saarinen but I aim a lot lower and dream a lot smaller, apparently—is a sunburst mirror. For a long time, I figured I'd just make my own; the Internet is rife with excellent tutorials—I emailed this one to myself in the dark days before Pinterest, for example—and I just generally, by default, like the idea of anything that involves both popsicle sticks and gold spray paint. I mean, don't you? Right, that's what I thought. It's human nature. But then I was browsing a terribly fancy and high-end furniture store known as Ross Dress For Less one weekday night and I came across this. Huh, I thought. I could do something with that. 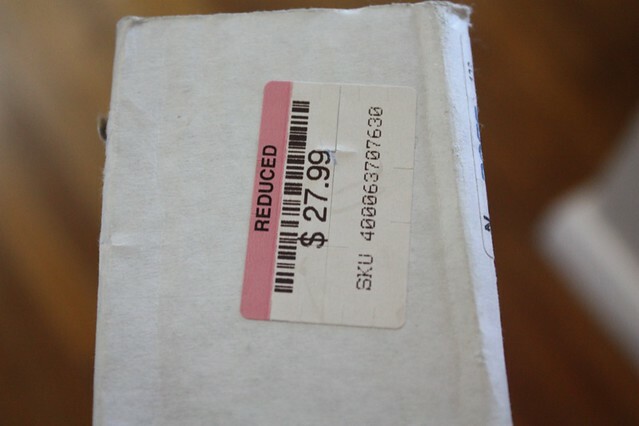 As a bonus, it wasn't exactly going to break the bank. I know, I know, I have super fancy tastes. So I bought it, took it home, and let it sit in my hallway for several months while I decided what to do with it. I knew I didn't want that cheesy-looking clock face, but I wasn't entirely sure I was up to the task of trying to find a mirror to replace it, either; after a brief visit to Michael's, where I determined that they only sold round mirrors in very specific sizes—none of which were even close to the size of my clock face—it seemed far too complicated. And then one day it hit me: mercury glass. Now I'm not even going to attempt to show you a tutorial for DIY mercury glass, because it's not my tutorial to share; I pieced together how to do it from here and here and here. What I will say, however, is that it is crazy easy; all you need is a can of Krylon Looking Glass spray paint, a few paper towels, and a tablespoon or two of vinegar mixed in water. After that, it's pretty self-explanatory; I removed the cheesy clock face from my sunburst mirror—it just opened up in the back—and was left with a piece of plain glass. I spray-painted the glass with the Krylon Looking Glass spray paint, squirted it a few times with the vinegar and water mixture, then dabbed it with a paper towel to get it all nice and smudgy, before spraying on a little more of the Looking Glass paint. I repeated this step five or six times to get it exactly how I wanted it to look, and once I was done, I had what I think is a pretty decent facsimile of mercury glass. 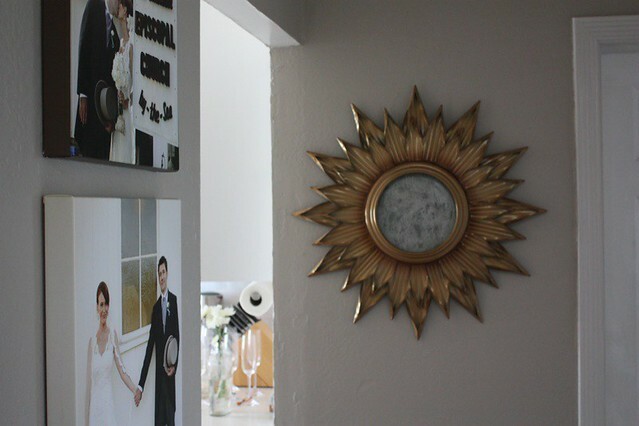 Maybe one day I'll get around to making a real DIY sunburst mirror with gold paint and popsicle sticks, but for now I'm kind of digging my hacked version, particularly since the whole thing only cost about $35 and half an hour's work. What can I say, guess I'm just cheap and lazy. That looks great, especially in the last photo. To be honest, I think this looks better than a real mirror would - I like the rough look you ended up with. Personally I'm really spartan when it comes to my own place (no frills), but this would make a good present - and only $35! If you decided you did want to make it a real mirror, a quick stop at your local glass shop would be an easy solution. They can cut a mirror to size for you and I bet it would be super cheap for a mirror that size. Love the mirror! But can we talk about your wedding prints on canvas?! Where did you have yours done. I've been wanting to do this but need a recommendation on someplace that does a good job. Thanks! My aunt had a sunburst mirror. Except the mirror part was rounded, not flat. Your reflection would be distorted because of it. I love your sunburst! One day I'll find one too. I love them! Oh it's beautiful! I don't know that I would have seen such potential in that clock. Good eye! Great DIY idea! I've never seen mercury glass before...cool effect. Love the mirror! I love your sunburst! One day I'll find one too. I love them! oh i love it! i was just googling DIY mercury glass as i'd like to do this for votive candles for our wedding. do you think that it's an insane project to take on to diy say 100 votive candles? it sounds easy but i'm not sure if it's worth the time! I don't love all the sunburst stuff I've seen out there, especially some of the DIY stuff, but I think this is just really cute. I really like the mercury effect. Now I need something like that! It's a little pricey, but I love it! That looks amazing! 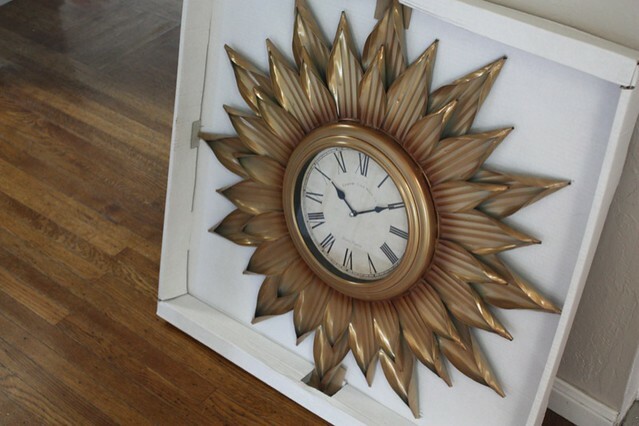 My roommate and I are also obsessed with sunbursts and I love the mercury glass look, though I'll admit I didn't hate the cheesy-looking clock. Second what Jasmine said, Where's the like button? Thanks for the continuous inspiration! I've also globbed onto your reading list - started Room last night and ended up reading until 2:00 a.m. last night! This is really interesting and I am sure that there will be a lot of people who will be interested in this fact.